La Malinche, Dona Marina, Malinalli, Malintzan – how many historical figures, let alone female ones, have been known by so many different names? No wonder there is so much mystery and confusion surrounding this misunderstood woman. Malinalli was born into the noble family of the Lord of Paynalla province of Coatzacoalcos, in the Veracruz region of southern Mexico (then a “frontier” region between the Aztec Empire and the Maya of the Yucatan). When her father died (it is said that he was killed because he refused to pay tribute to the dominant Aztecs), her mother remarried and gave birth to a son. Although Malinalli was her father’s firstborn and rightful heir, her mother and step-father favored the new baby. So that the baby-boy would inherit, Malinalli’s mother gave her away to the slave-traders and declared that she was dead. 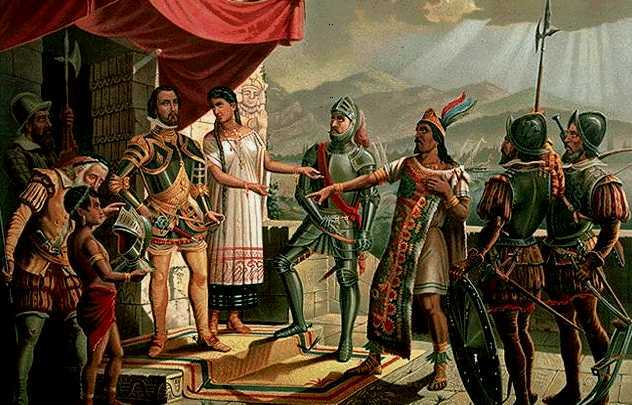 When the slave Malinalli, along with 19 other girls, was presented as a gift to the Conquistador Cortes in 1519, he ordered they be converted to Christianity and her Catholic name became Marina. The Spanish soldiers quickly realized she was special and refined and began calling her ‘Lady’ or Dona Marina as an honor. After Marina began translating for Cortes with the indigenous tribes they encountered, the natives soon began referring to her as Malintzan, which loosely means ‘Marina’s Captain’ since they had difficulty distinguishing between Captain Cortes and Marina because she spoke for him exclusively. The Spanish version of Malintzan is Malinche and the feminine ‘La’ was eventually added to indicate Marina, so she became known as La Malinche. When La Malinche gave birth to Cortes’ child (who thereby became the first Mexican), she will always afterwards also be known as the Mexican Eve. Centuries later, when the Mexican writers attempted to reclaim their past culture, La Malinche was accused of being a traitor and unfortunately took on the burden of curse words and negative connotations as ‘malinchista – To be called it is to be called a lover of foreigners, a traitor.’ and La Chingada (the f_cked one. La Malinche deserves so much better…. This entry was posted in Malinche, Uncategorized and tagged conquisadors, conquistadors, cortes, cortez, dona marina, la malinche, malinalli, malinche, malintzan. Bookmark the permalink.